Honestly, I must admit that ESET does have significant impact on my daily browsing activity. The issue is still persisting even though I have pre-release update installed, but that is just my system. How about yours? You might not have any issue though. Could you try uninstalling ESS and installing EAV instead to find out if the mentioned problems with browsing persist? Do you experience these problems with any browser? 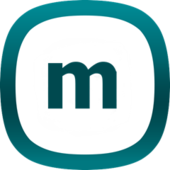 What operating system / platform are you using? I am using Windows Vista and I think I only have problem with Chrome. Sometimes when I want to view a webpage, the webpage will just go crashed with Chrome. Sometimes, the webpage doesn't load properly or load too slow. However, when I try to surf to the exactly same webpage with Firefox, it works perfect. But I want Google Chrome as its browsing speed is much faster than Firefox. If it is just a minority of users like me have such browsing speed issue then I think there are some incompatibility issues between ESET and the system or other software installed in that system. I personally think that we should have a survey for browsing and Internet communication experience after installing ESET at this forum. Based on the result, we could know that the source of problem likely comes from ESET itself or the users' system or software. I would have such suggestion is because I have realized that most of the users seem to have no problem with browsing and Internet communication with ESET installed in their system and not many similar issues reported. Therefore, I have no idea I am the minority or the majority one. As the user yongsua mentioned Eset does have significant impact on daily activities. And there is some prob between Eset & Chrome. I too face similar prob with ESS/EAV & Chrome. And I find EAV better compared to ESS. EAV feels lighter & browsing seems better & faster compared to ESS. May be ESS FW affects network. With ESS installed, the speedtest for download/upload always show below 2mbps. With EAV installed, it correctly shows around 4mbps, occasionally around 3mbps. With ESS installed, during browsing I can see the impact as pages on opening kind of gives the stutter effect. With EAV I don't see this, occasionally its there. With ESS installed, could you try temporarily disabling ESET Lightweight filter in your network adapter setup to see if it makes a difference in terms of browsing and upload speed? To solve Chrome issue with ESS/EAV, Chrome exclusion under Protocol Filtering had worked. But I didn't test it for long so couldn't say for sure PF is the culprit. Currently running EAV, if I get time will install ESS & test. Currently running EAV & since Chrome updated from .89 to .101, no probs yet. And ESS doesn't disable Win FW. Win Control Panel shows Win FW disabled & managed by Eset. But Win FW Advanced Settings shows all, Domain/PVT/PUB as ON. With ESS installed & all 3 networks manually disabled in Win FW, Why do I still get sometimes network selection window from both Win FW & ESS FW? It maybe means that ESET doesn't have enough privilege to completely turn off the Win firewall. Anyway, excluding Chrome from ESET PF is never a permanent solution. Installed ESS now & will report any probs/findings here. Is it a bug ESS doesn't disable Win FW i.e Win CP shows disabled but Adv Sett shows enabled? 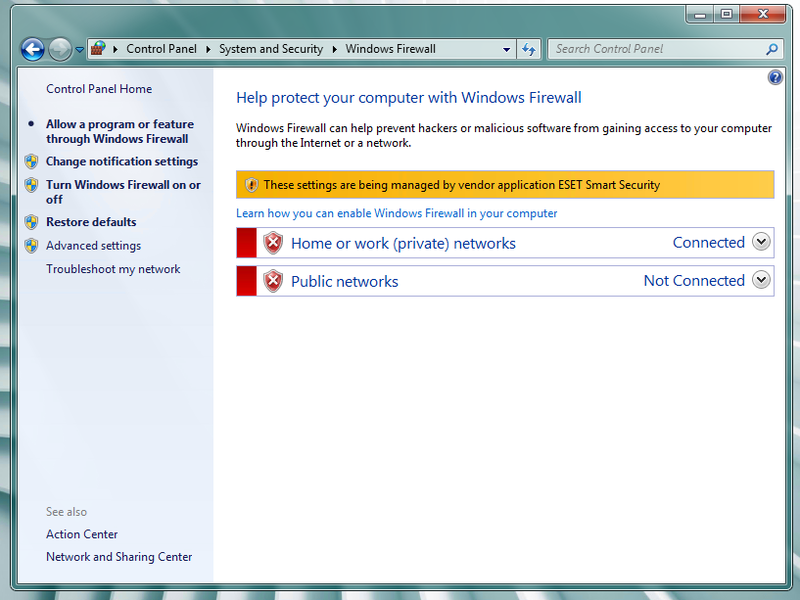 And even if I disable all the 3 networks in Win FW Adv Sett, why do I still get network selection window from Win FW too? 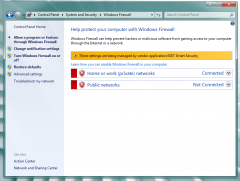 I dont get network selection window from Win FW on Comodo Internet Security installed. Weird. I do not have this Windows FW issue. I suggest that you just disable the Windows FW service by running "services.msc"(without the quotes), you may also set the Startup Type to Disabled. And slowdown & Chrome probs returned. Disabled lightweight filter, didn't solved any prob. Disabled network attack detection, didn't solved any prob. Disabled bot protection, didn't solved any prob. Under FW Integration, set to FW inactive, didn't solved any prob. Under FW Integration, set to completely disabled, semi-solved i.e random probs. Restarted the system, same random probs. Uninstalled ESS, slowdown & Chrome probs solved. Installed EAV, slowdown & Chrome probs solved. UPDATE - Chrome prob with EAV is back. Now I strongly suspect Protocol Filter as excluding Chrome works. And I think Web protection also slightly affects Chrome as occasionally sites open little slow. No probs with Internet Explorer. UPDATE - Now I am pretty sure Protocol Filtering is the main culprit for Chrome prob as since excluding Chrome, its working superb, zippy. What are the disadvantages of excluding Chrome under Protocol Filtering? In this case ESS or NOD32 won't scan the network traffic from chrome for malware. However all files saved to disk are scanned anyway, so if you find no other (temporarily) solution you could let it this way. If they doesn't look like this then maybe something went wrong at the installation. - malware in archives could make it to the disk and run under specific circumstances. Chrome is my main browser. Guess will have to try other AV for the moment. I am pretty sure Protocol Filtering is the main culprit for Chrome prob as since excluding Chrome, its working superb, zippy. Just to make sure, does the problem persist with pre-release updates enabled and Internet protection module 1185 installed? For the moment I am trying another AV. But if I reinstall EAV, I may not try prerelease stuffs as I dont install beta/prerelease stuffs on production system. I dont have test machine. Can prerelease updates be uninstalled after testing then I could try. Or may be under Shadow Defender I could try. While there is always a possibility that something could go wrong on a pre-release update it is a rare thing. I've been on pre-release for over a year and have not seen a problem arise. Sometimes a pre-release can be the answer to your issue. However I do understand your reluctance. Pre-release updates can be enabled/disabled as you wish, they are not exactly "beta" modules as they go through in-house testing before you get them as well. And like SCR I have been on pre-release for a very long time and not once has a pre-release module caused problems, quite the contrary, they have fixed problems faster than having to wait until they are put on the standard update servers. Ok, I will give a try. I want to use ESS but its giving me more probs i.e browsing slowdown & chrome prob compared to EAV i.e chrome prob only. So I am running EAV. Now the prob is everytime there is a suggestion here in the forum, I have to uninstall EAV, install ESS, then reinstall EAV as the prob is not solved, then update & complete the scan as it mention improves future performance. This becomes troublesome. It would be good if there is an add/remove feature in ESS i.e you can add/remove AV/FW. If I will try prerelease, will post the outcome here. Live Grid - Realtime i.e Resident protection also has Live Grid blocking, right? Internet-borne threats - This will be blocked by Resident protection if they try to enter the system, right? Archives malware run - This will be blocked by Resident protection, right? So threats will not be blocked at chrome level but will be blocked at system level, right? Is the protection provided by webshield same as resident protection & just an early detection of threats or webshield scanning abilities & protection are different than resident protection? Is the procedure correct to perform prerelease updates for latest version ESS/EAV 8? Check prerelease updates, clear update cache, ok & restart the system & then perform update. Check regular mode & then ok. I had actually only cleared the cache for the first time before I tried the pre-release update. Yes, to revert back, you just have to check regular mode but then your update cache will be cleared and regular update will then be downloaded to replace your pre-release update after you reboot your system. As I have mentioned earlier Eset doesn't disable Win 7 FW i.e Win FW section shows in red colour & managed by Eset. But Win FW advanced settings shows Private/Public "ON" & I manually "OFF" these. Could disabling these be the reason for browsing slowdown? I mean does Eset FW works with Win FW & need these "ON" & that's why Eset FW doesn't "OFF" these or Eset FW is not dependent on Win FW & it is safe to "OFF" these? Ok, tried for more than an hour. Prerelease updates didn't worked for me i.e exactly the same prob. And product update I understand, how can virus databases update solve the mentioned issue in this thread? And I dont understand, sometimes browsing is fine & suddenly prob appears & then again fine & then again probs. And I must mention when it works, works zippy & when doesn't, quite slow or sites keeps loading & never loads for quite a long time & you cancel. I use only Adblock Plus & had uninstalled it for the tests. And FW correctly picks router IP but when I use my direct connection it picks my IP wrong as 169.x.x.x I delete the zone rules, restart the system, still it picks wrong most of the time. But I think this is not the reason for the probs as net works the same even if IP is detected correctly. Also I tried selecting both Home & Public but the same issue on both. And yes I restarted the system everytime I changed something to test. I will try EAV again & see how thing goes otherwise may try other AV as currently little busy. I may not be able to do further tests & provide feedback as mentioned little busy & this is taking time & affecting work. Thanxx all for the support & valuable time. Any time I get will be here to see any updates or report any findings from my side if I did any tests.